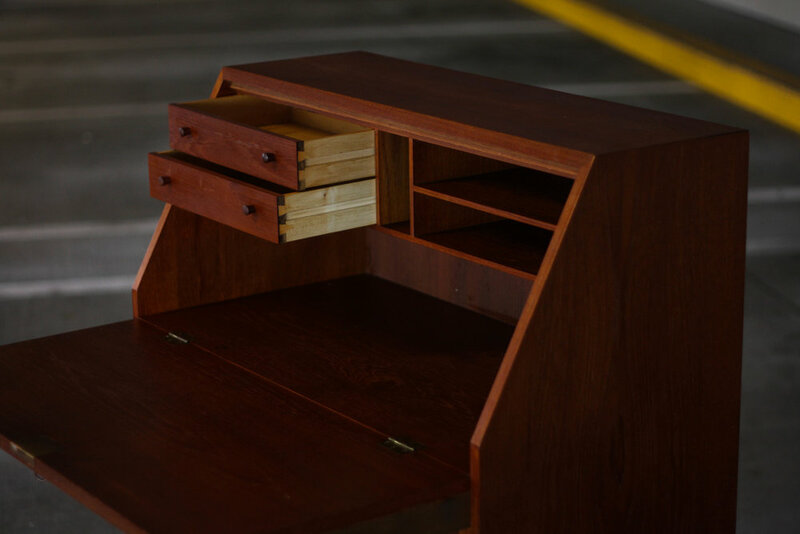 Beautiful Danish Modern teak secretary by Borge Mogensen for Soborg Mobelfabrik. Retains its original foil lable and a "Made in Denmark" stamp. There is ample storage in this multi function piece. The three lower dove-tailed drawers feature sculptural pulls and plenty of space for your books and oddities. The two smaller drawers on the top left, when the door is lowered, help hide your desktop clutter; pens, charging cords, earbuds, etc. Gorgeous tapered legs that are a welcome break from the more common cone shaped feet on most mid century pieces. The top right sections features visible storage space for you to put your pretty decorative pieces (books, pictures, art). Note the hidden pulls that slide out and allow the drop leaf door to rest on them. Making sure your wake space is nice and sturdy. 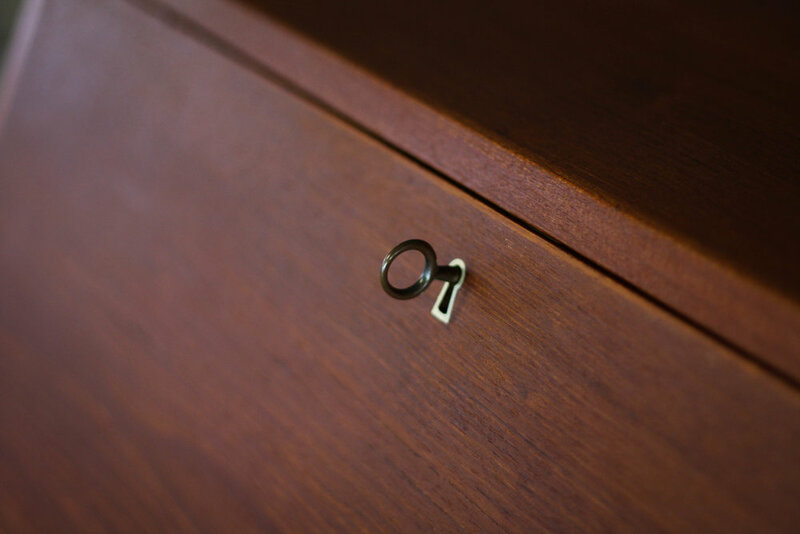 Retains the original skeleton key, ensuring you can lock your valuables in the secretary for safekeeping. As is the case with any mid century piece, there are various blemishes and imperfections to the piece. Most notably; a ding on the interior of the drop-leaf door, and small spot of missing veneer on the back corner of the left side. Overall the piece shows well, and unless your house-guests inspect every inch of your furniture pieces, they would never notice the imperfections.